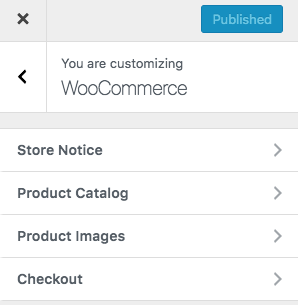 WooCommerce Customizer is part of WordPress > Customize and makes it possible to select options that apply site-wide for Store Notice, Product Catalog and Product Images without touching code. From the WordPress dashboard, go to: Appearance > Customize. Each is covered in detail below. Informational – A note that tells customers of shipping delays due to weather conditions. An ‘away’ notice if on vacation. Promotional – A note advertising an event, a holiday special, a bundle, a sale on all/some items or free shipping. 2/ Enter a message in the text area. 3/ Tick the box for Enable Store Notice. 4/ Preview how the Store Notice looks on your site/store. 5/ Publish when satisfied and ready for your Store Notice to go live. This is how the Store Notice displays on the front end of your store/site. Visitors can choose to Dismiss the notice after seeing it once. *Location and appearance of the Store Notice will vary, depending on the theme you’re using. Screenshot above is with our free Storefront theme. Edit the message in the text area to change it. Untick box for Enable Store Notice to stop displaying to visitors. 3/ Publish to save changes. Using the Schedule option for Store Notice can be helpful when running a promotion for a limited time or ending a sale/discount at midnight on a specific date. In this example, we want to discontinue the Free Shipping offer when it expires end of day on February 28. 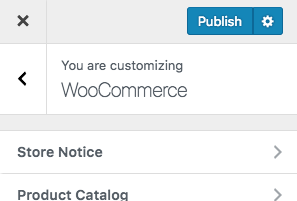 1/ Go to Appearance > Customize > WooCommerce > Store Notice to view and access the current/published promotion. 2/ Untick box for Enable Store Notice. 3/ Select the gear wheel. A panel opens. 4/ Select Schedule on the right menu, then enter the Date and Time you want the change to take effect. 5/ Select Schedule to make changes you entered on the future Date and Time indicated. *You need to disable sale discounts, coupon codes or limited time offers. Removing the notice does not automatically stop the promotion from running. All options for Product Catalog can be found at: Appearance > Customize > WooCommerce > Product Catalog. Your Shop Page can display Products, Categories, or both. We recommend selecting one for a clean look. 1/ Select Products or Categories from the dropdown. 2/ Preview your selection live. You must be viewing the Shop page. 3/ Publish to save and go live. Your Category Pages can display Products or Subcategories within a Category, or both. Selecting one is recommended. If you only have a few products, or you have no subcategories, there may be no difference in appearance. 1/ Select Products or Subcategories from the dropdown. 2/ Preview your selection live. You must be viewing a Category page. Default Product Sorting allows you to control the order in which products are viewed on Shop and Category pages. Visitors still have the option to sort a different way, if desired. In this example, we’ve chosen Price Ascending (sort by price: low to high with a √), and the customer is selecting to sort by Most Recent (newness). 2/ Preview your selection live. You can be viewing the Shop page or a Category page. Products per Row allows you to choose the number of items that appear in a single row on Shop and Category pages. 1/ Use arrows to increase/decrease the number of products. 3/ Test on different devices. Below is an example of different views, using the same settings. *Scaling of image size and appearance will vary, depending on the theme you’re using. Screenshots above are with our free Storefront theme. 4/ Publish to save and go live. Rows per Page allows you to choose the number of rows that appear on Shop and Categorypages. 1/ Use arrows to increase/decrease the number of rows. This saves you time and energy in manually cropping and resizing each one. Thumbnail Images are the smallest images used in the Cart, Widgets and (optional) Gallery images underneath the Single Product Image on individual product details pages. Single Product Image is the largest image and refers to the main/featured image. Product Images settings in WooCommerce Customizer do not apply to these. To add, edit or delete the Single Product Image or Product Image Gallery, see: Adding Product Images and Galleries. *Previously, thumbnails needed to be regenerated using a third-party plugin. WooCommerce 3.3x now handles this for you. Preview mode will not trigger regeneration. 1/ Go to: Appearance > Customize > WooCommerce > Product Images. Custom – You select the ratio in which images are cropped. In this example, 1:2 is entered; and one image cannot be enlarged to meet this requirement. Uncropped – Images appear as is, which can result in all being different unless you used photos that are uniform in size and resolution. The screenshot below is an example of this: One is perfectly square, the next is a smaller square, and the last is a rectangle. All options for Checkout can be found at: Appearance > Customize > WooCommerce > Checkout.